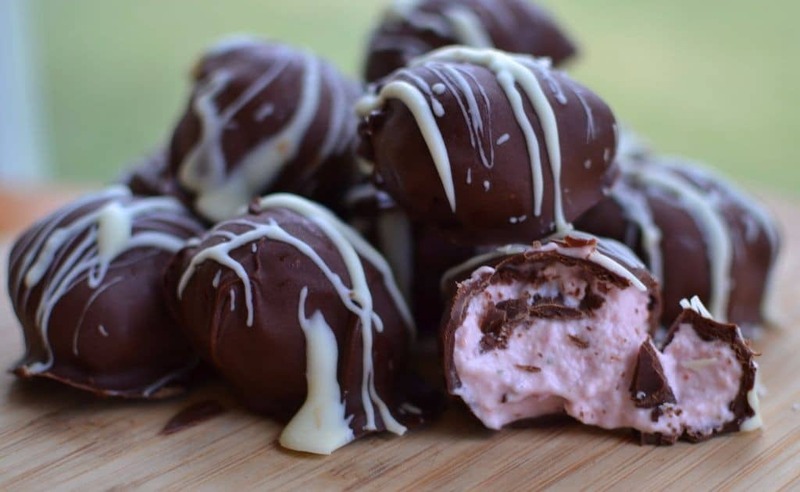 Strawberry Cream Truffles are what it is all about! They are creamy, smooth and full of scrumptious goodness! For the most part truffles are very easy. The hardest part is rolling them. It takes a little patience. Look at that! 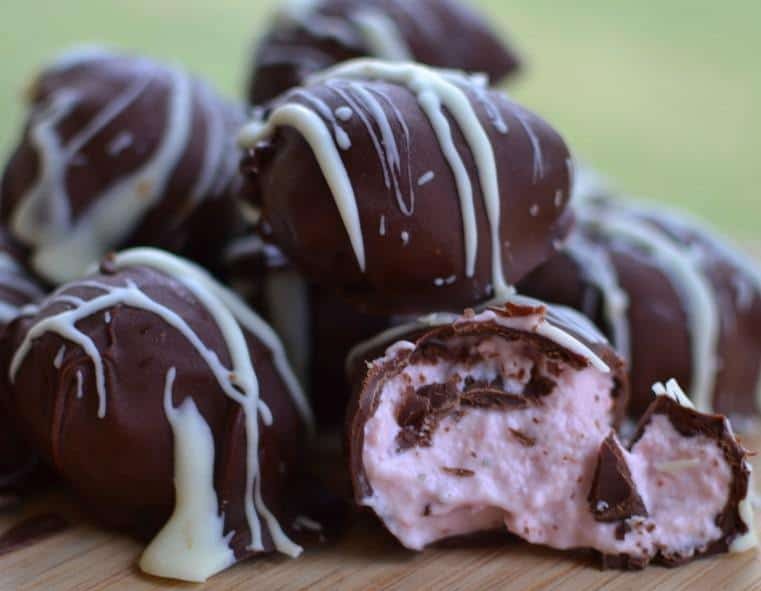 Who could resist all that creamy strawberry and creamy chocolate! I know!! I can’t and I won’t!! In food processor combine strawberries, cream cheese, melted white chocolate.and powdered sugar. Pulse until smooth and creamy. Place in freezer for 2 hours. Using small ice cream scooper; scoop into 12 balls and place on cookie sheet back in the freezer for 1 hour. Roll into balls using your hands. Place back in freezer for 1 hour. Combine chocolate chips and coconut oil in small bowl. Microwave for 1 minute at 50% power. Stir and continue for 30 second intervals (50% power) until smooth and creamy. 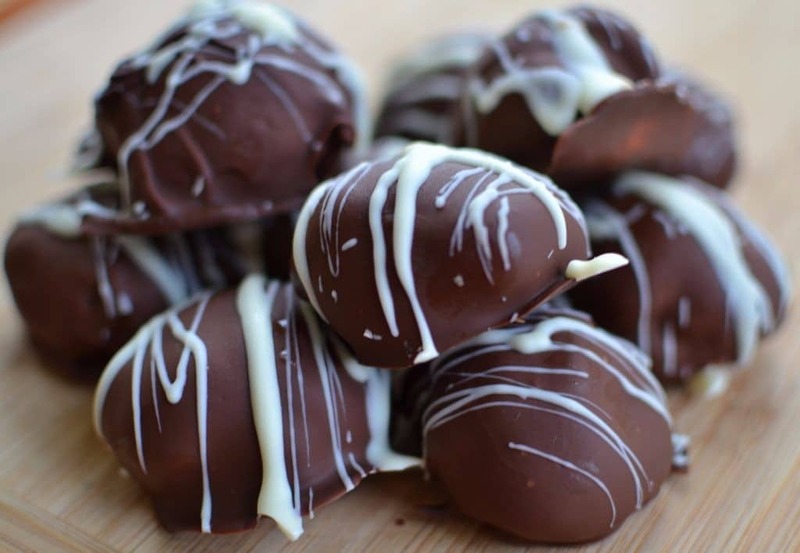 Carefully move frozen truffles through the melted chocolate. Remove to wax paper and place in freezer for 10 minutes. Melt white chocolate in microwave at 30 second intervals (50% power) and coconut oil until melted. Drizzle over truffles. 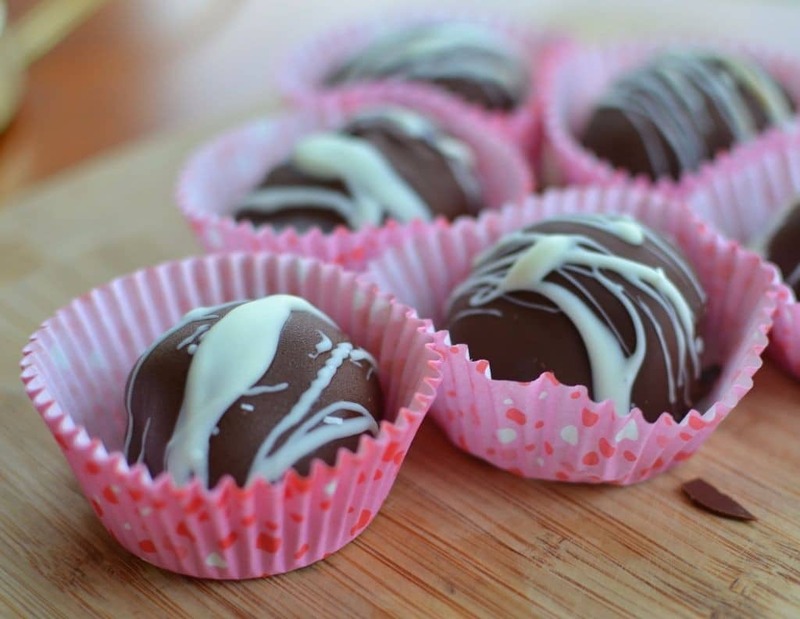 Refrigerate truffles. Plain crisco (not the “butter” type) can be used to thin chocolate! Can you taste the coconut oil once the truffles are done? Maybe just a pinch although my daughter said that she did not taste it. Could you. Please clarify the amount of white chocolate chips needed? Thanks so much. My apologies. It is 1/2 cup white chocolate chips. Do you have to keep them refrigerated after making them? Yes please! Sorry about the delay. I was Christmas shopping and wrapping!